Ask any good quarterback and he will tell you the guys up front are really what make everything happen on Friday nights. Few people would argue that the game is won on the line of scrimmage but many times those linemen never get their names called. All summer teams have worked on their skill positions but the linemen are putting in just as much work as the other members of the team. There are plenty of 7-on-7 tournaments and quarterback camps out there but very few summer events are designed for linemen only. One event that highlights the skills of the big guys is the Blue Springs Linemen Challenge. 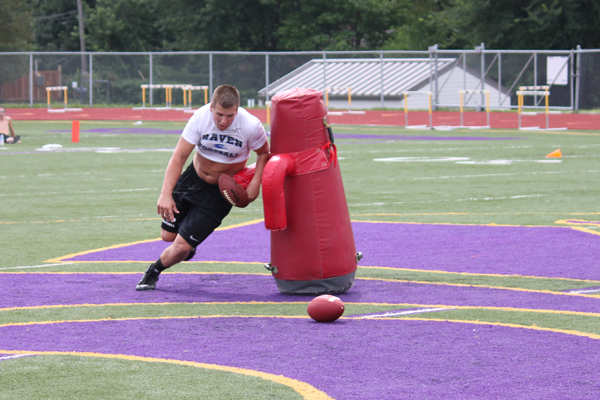 This year four teams brought their linemen to Blue Springs to compete in the annual competition. When the dust settled on a hot afternoon last Friday, Lee’s Summit West won the team competition followed by Blue Springs, Olathe Northwest and Winnetonka. The individual portion was won by Blue Springs senior Josh Baker with 175 points followed by the Titans’ Adam Klausing with 172 and Olathe Northwest’s Taylor Brashear in third with 170. Winnetonka’s top finisher was Brett Morris who tied for fourth with West’s Tyler Ray with 166 points. Baker said he was very motivated to do well this year after finishing second the year before. “Last year I was a junior and I got third place overall and it gave me the motivation to come out here again,” Baker said. “I just love competing. It was real fun. Even though Klausing fell a few points short of the individual title he was really pleased with the way his team performed winning the overall title. “We really came into this thinking how we could contribute as a team and working towards that first place,” Klausing said. The event was extremely beneficial for Olathe Northwest. The Ravens got to get a big group of linemen some skill work and competition while getting to know some other teams they wouldn’t see during the regular season.